MISH LOVIN' LIFE: BIG NEWS!!!!! EFF NO, I'm not preggers. But I bet for just a split second you thought I was. Don't lie. And V Dizzle, you can breathe regularly now, too. are having a baby girl this November! My very first niece, and I couldn't be more excited! Because well, let's just be honest here, I can relate much better to girls. No offense to my nephew, Bryson. I love you man. But there's only so much Thomas the Train talk I can get excited about. And yes, for all of you trying to count the months...Only 4.5 more to go! I might have freaked out a lil bit thinking it was you that was pregnant! Hahaha. Phew! Way to call them out on their pre-marriage behavior. Congratulations to all! P.S. Don't take this the wrong way but, are they having a horse? Any reader of yours should have known that YOU weren't pregnant. It's just the kind of prank you would pull! Congrats to the family! First niece! Wahoo! Congratulations to your whole family! That is wonderful news. I think we all knew you probably weren't pregnant... you just got done running a marathon, and I heard those little buggers make that feat 1000% harder! Congratulations again! I thought this was super cute and then I got to the end and I laughed so hard I sneezed. You're going to be the best aunt ever. Being an auntie is so fun! But I can relate to having nephews...jealous you are going to have a niece! Only boys so far in this fam! lucky lucky!! how exciting! it must be fantastic to be an aunt! omg you caught me, for a split sec i thought what?! mish?! no way! hahah! how exciting tho! babies are the best! Haha, I did indeed think you were preggers. 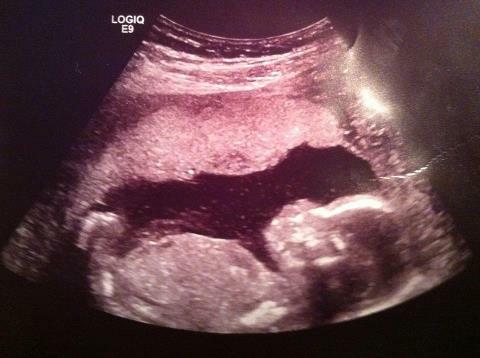 Or at the very least had stolen someone's ultra sound photo. But if it's your brother's baby, then it's okay! :) Congratulations! Congrats on becoming an aunt again! Hope you and the lil one can be all girly together. And LOL on the naughty. I'm sure the parents are ok as long as there is offspring.